Where do you draw the charismatic line? This question would have been easy to answer 30 years ago. People were largely conservative, or charismatic. It wasn't a perfect Christian world, but at least there was some clarity. Nowadays, there is a growing obsession with the mystical and a lust for signs and wonders in nearly every corner of evangelicalism. Some people are quite confused or just uninformed, while others teach things that have biblical foundation. The mist of confusion continues to permeate the church and the next generation of young Christians are heading for an even foggier future. Terms surrounding this topic abound as people seek to explain their nuanced views on signs and wonders. Some call themselves “open but cautious” when it comes to all the hype, while others call themselves Reformed Charismatics, who hold to Reformed soteriology but fly the coop on other doctrinal positions. Meanwhile, millions of Charismatic Catholics are merging into the waters of mainstream evangelicalism. What’s more? Who would have thought the day would come when we would have Charismatic Calvinists? What semblance of biblical orthodoxy will be left to our children and grandchildren? Over the past several years a new breed of charismatic theology (and then some) has invaded the mainstream church. In an effort to maintain some level of tolerance and avoid broad-brushing every charismatic, many church leaders have wavered on what was once an open and shut case. This new breed is the New Apostolic Reformation, or what I personally like to call the Mystical-Miracle Movement. Leaders claim that God has reinstated the apostolic era and that they themselves are now Apostles. If you’re looking for Scriptural evidence to back up their claims, you won’t find any. Instead, they argue that “God told them” they were Apostles. These (false) apostles have undoubtedly gone beyond the usual charismatic teaching on speaking in tongues and slaying people “in the Spirit.” They’ve launched into historical heresies like Ontological Kenotic Christology. That mouthful of a phrase is the very un-orthodox teaching that Jesus laid aside His divinity during His time on earth. The reason they teach this is to promote the idea that, "Jesus was just a man doing signs and wonders--you can do them too!" In days gone by, this type of teaching would be tossed aside as nothing more than fringe antics by some laughable group living on the outskirts of town. What’s so different now? Major proponents of this teaching include well-known speakers and their world-famous bands who headline today’s biggest conferences. Bands like Jesus Culture and Bethel Music, along with their apostolic leaders like Bill Johnson, Todd Bentley, Heidi Baker, Todd White, Lou Engle and many others. If you don’t know about them, your youth, college, and young adult ministries do. You might be asking, why is this a big deal? The reason is that the Christ they proclaim and the gospel they propagate is not the biblical Christ or His message. This is not about essentials and non-essentials. This is about salvation. It’s a tier 1 issue. In a growing number of churches total confusion has taken the place of clarity. People have begun to elevate emotionalism over truth. "Doctrine" has become a four-letter word. People are mesmerized by an eloquent speaker who promises signs and wonders while spoon feeding a poisonous version of the gospel — which is no gospel at all. Desperate hopefuls bring their sick children to be healed while others looking to tap into that power press in as well. For an offering or submission to their apostolic authority, they offer healing. For a tuition payment, they’ll even teach you how to perform signs and wonders too. With schools of heretical theology exploding all over the world and targeting our young people, what are you going to do to stand firm in the truth? Are you going to sit on the sidelines calling for unity when the gospel is being assaulted? Or, will you remember that it is better to be divided over truth than united in error? When it comes to false teachers, it is imperative that Christians realize that this is spiritual warfare. Satan takes no prisoners. We need to remember that “many will follow their sensuality, and because of them the way of the truth will be maligned” (2 Peter 2:2). The devil doesn’t show up with red horns and a pitch-fork to deceive people. He likes to use those who appear to be "workers of righteousness" to do his dirty work (2 Corinthians 11:13-15). Worse, he loves when Christians ignore the threats while simmering like a frog in the slow boil of false unity. How do we help future generations thrive in biblical discernment? For many parents, this is the struggle. They expected their church to do all the heavy lifting. Discipleship was the children’s pastor’s job and the youth director’s role after that. Meanwhile, the parent’s mediocre spiritual life is not appealing to their children, their powerless prayer life does not bear fruit, and their empty version of the gospel they've attested to saves no one! They haven’t served, suffered, or celebrated with bold passionate faith. Nominal Christianity is quite possibly the deadliest Trojan horse of all. We must live our lives in accordance with the truth we proclaim. Your kids are weighing your words and your actions. Make no mistake about it, your actions are what tip the scales. In order to keep our homes and our churches centered on the firm foundation of Christ, His word must be known and taught consistently. It may be unpopular to speak the truth, but it’s the avenue through which Christ is effectively proclaimed. We can often be guilty of doubting the power of the word but it’s the word that has everlasting power! True Christians will be hated for their allegiance to Christ and still take Christ at His every word. Faithfulness is contagious. To learn more about the Shepherds 360 Church Leaders Conference and to register to attend, please click here. Costi Hinn is the Executive Pastor at Mission Bible Church and is completing his Masters of Divinity at Midwestern Baptist Theological Seminary. He is the co-author of Defining Deception (SCS Press, 2018) and author of God, Greed, and the (Prosperity) Gospel (Zondervan, 2019). 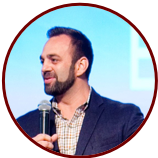 Costi will be presenting as a General Session speaker at this year's Shepherds 360 conference on Communicating Truth.